Brother to White, Charles Ward: Service no. 675821, who was killed November 1917. Daily Sentinel-Review. September 20, 1918. Page 1. A Brother of Chas. White, Who Was Killed in Action Some Time Ago — Both Enlisted With the 168th Battalion. Mr. and Mrs. John B. White, 599 Peel street, received word this morning of the death in action of their son, Pte. William Wallace White, aged thirty-one. The cable came from their daughter-in-law, Margaret White, now in England, who also stated she was coming home. Deceased was a promising young man and prior to his enlistment was a bridge builder on the C.P.R. He was born in Innerkip, where he lived with his parents until some six years ago, when they moved to this city. He went overseas with the 168th Battalion in company with his brother, Chas. Ward White, who was recently reported killed in action. Just a few days ago word was received that he had been wounded for the second time. Besides his parents, he is survived by three sisters, Evelyn, Margaret and Maud, all at home, and one brother, Bert, who lives in the city. Source: Daily Sentinel-Review. September 20, 1918. Page 1. His brother, Private Charles Ward White, reg. no. 674821. Source: Daily Sentinel-Review. December 11, 1917. Page 1. 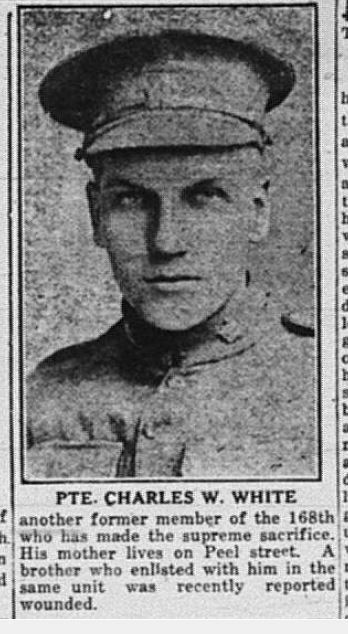 He was killed in action November 12, 1917.